Last week, famed fan-artist BossLogic imagined what Batman and Superman would like circa the 80s, in a clever spoof of Wonder Woman 1984. 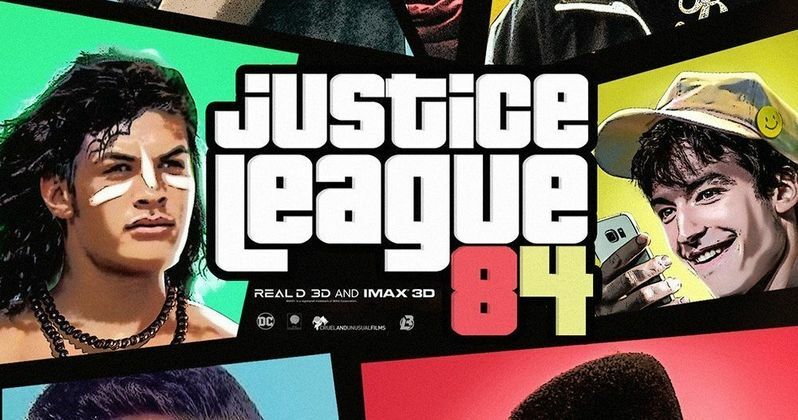 Now he's added the rest of the heroes, including The Flash, Cyborg and Aquaman, and brought them all together in one glorious, hilarious fan-made Justice League 84 poster that looks like the best throwback movie ever. The poster kicks off with Diana Prince in her new 80s Wonder Woman costume, sporting Ray-Ban sunglasses of the era. Up next is Ben Affleck's Bruce Wayne, who is channeling the actor's Good Will Hunting days. He's showing off a stylish Adidas jacket, with a giant gold B medallion bumping against his chest. He's also flaunting awesome 80s sideburns, but here we don't get to see the cool Batman fanny pack or his caffeinated can of Jolt cola. Mustache gate will be very hard to forget. Henry Cavill famously grew out his mustache for Mission: Impossible 6, and wasn't allowed to shave it for Justice League reshoots. Now, that look is brought back, with a Clark Kent who didn't seem to get through the 80s with a lot of interest from the ladies. He's a straight up nerd. Gone is the spit curl and glasses. Instead, Clark is sporting that greasy mustache and the wickedest mullet Krypton has ever seen. He's also wearing a god awful purple polo shirt. You'll be forgiven if you discover the urge to vomit. Victor Stone, aka Cyborg, is rocking the Kid 'N Play do, wearing the blue and red framed glasses along with a thick gold Transformers chain. Aquaman is just a teenager here, though you can't see his cali board shorts, the original art had him carrying an 80s style surfboard. You also can't see the giant shark teeth he wears around his neck as the perfect King of Atlantis souvenir. New to this image, which wasn't included in the original artwork, is The Flash. While it's 1984 for the Justice League, it appears that the speedster has been doing some time traveling. He's wearing Marty McFly's hat from Back to the Future 2, topped with a smiley face pin from the 70s. And he's snapping photos of all the 80s madness with his iPhone from 2018. Perhaps this opens up the story behind Justice League 84. Barry Alan goes back in time to call on his future superhero mates. DC is in transition right now, with Wonder Woman 1984 one of the biggest releases coming down the block. It arrives next summer. Before that, we're getting Aquaman in his first standalone movie this December. Both Aquaman and Shazam! are heading to Comic-Con in a few weeks, where we expect to here some more big surprises. For now, enjoy the Justice League as they get a clever 80s makeover.